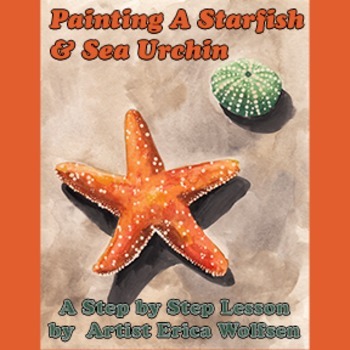 In this lesson students will learn how to draw a starfish and a sea urchin laying on sand. Lessons are step by step and designed for success regardless of the student's level. This painting is designed to take 45 minutes to complete in full. The sample is completed in watercolor with acrylic paint for the dots, but feel free to use other mediums if you prefer, such as colored pencils, or pastels.